Increasing clouds, with a low around 50. South wind around 6 mph. A 40 percent chance of showers, mainly before 1pm. Mostly cloudy, then gradually becoming sunny, with a high near 71. North wind 7 to 17 mph, with gusts as high as 25 mph. New precipitation amounts of less than a tenth of an inch possible. Mostly clear, with a low around 42. Northwest wind 6 to 13 mph. 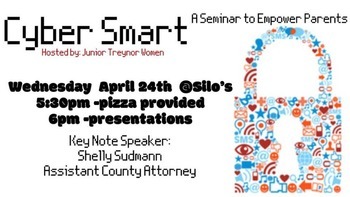 Junior Treynor Women is hosting another safety seminar this year at Silos Restaurant on Wednesday, April 24, 2019. Pizza is provided free of charge and dinner service will begin at 5:30 p.m. Presentations will start at 6:00 p.m. and will feature keynote speaker, Shelly Sudmann, Assistant County Attorney. Treynor High School senior students Alex Lowe and Tyler Pollock will also present a session on what parents don't know about their child's smart phone. Although the topic was covered at last year's safety seminar, the technology world is always changing so fresh topics and knowledge will be shared. RSVP via their Facebook event or send an email to juniortreynorwomen@gmail.com so that they have enough pizza and seating setup for everyone. On Friday, April 12, 2019, after a week of Iowa Assessment testing, Treynor Middle School and High School students and staff spent the day at the Open Door Mission. The day started at 9:30 a.m. with a welcome in the Garland Thompson Men's Center Chapel/Cafeteria Area by Amy Harvey, Open Door Mission's Community Relations Director. Candace Gregory, President and CEO then spoke and interviewed Dan Lang. Students were then split into groups for a campus tour and service learning projects. Event co-chair Mr. Scott Rucker, said "All the students had great attitudes toward giving back and working hard, a direct reflection of the enthusiasm and emphases that has been modeled to them by our great teachers.". Event co-chair Mrs. Jane Leick stated "This day could not be a success without the right mental approach". Candace Gregory wrote the team leaders and expressed how impressed she was by our student's accomplishments and the respectful attitude they displayed. Click on the picture slideshow below to see our students in action on Friday. 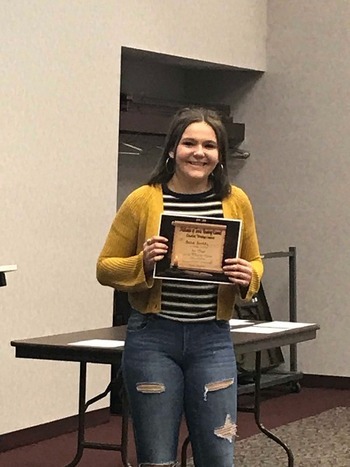 On Thursday, April 11, 2019, Treynor students were presented awards for the Midlands of Iowa Short Story Contest. This contest was sponsored by the Iowa Reading Association. Anna Braddy, 7th grade, and Monica Osborn, 6th grade, won first place for their age group. Anne Miller, 4th grade, placed second. Congratulations to these girls for their hard work. Click on the picture slideshow to the righ to view each student with their award. Pictures were submitted recently by some Middle School and High School teachers of student learning in their classroom. Take a look at what is happening in those classrooms in the slideshow below. Click on each slide to advance. 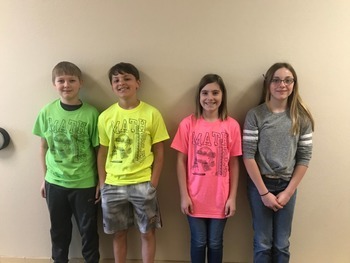 Sixth graders Griffin Gregg, Peter Young, Kallie Danker and Monica Osborn recently participated in the Math Bee. They did a great job and finished in 5th place. An unapproved draft of the 19-20 academic calendar is now available for review. If you have comments or want to share your thoughts about the calendar with the board, written comments can be sent to lhowell@treynorcardinals.org and she will share with the board at a future board meeting. Studies show that good emotional health has a positive impact on student success at school. Today’s students face many stressors that can affect their emotional health, ranging from brief difficulties that affect a student’s ability to learn to more serious problems that may have a long-term impact on the student’s well-being. While the school counselor may address some concerns, a major crisis or event in the student’s life may require assistance from professional mental health experts. Therefore, Treynor Community Schools is collaborating . . .
District newsletters are sent out eight times per year, in August, October, November, December, February, March, April and May. 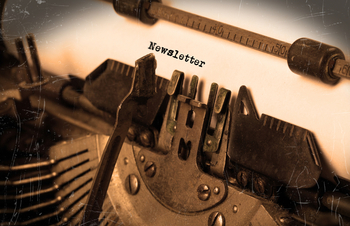 These newsletters contain important information about the Treynor School District and happenings at our buildings. Click on the link below to read the latest news from Treynor Community School District: April 2019 Past Newsletters: March 2019 February 2019 December 2018 November 2018 . . .